Although I got the news via a voicemail from his ex-wife on Sunday afternoon (ironically I’d missed the call due as I was watching Leeds at Upton Park) it’s taken a while for it to sink in, and until now to gather my thoughts and revisit the fanzines, newspaper articles, photos and comments which surrounded his presence at Maidenhead United Football Club. Although Steve Jinman's excellent blog post provides some insight into Trevor, it’s worth providing the KSG perspective. Indeed, the loose collective we associate ourselves with has been known for many years as the KSG, which derives from the name “Kingham Security Group”. This moniker came about when we used to joke with Trevor about the ragbag collection of security staff at his disposal when he looked after security at York Road. John Greening and Stinky Man anyone?! Given his colourful past we’d laugh about how he was likely to act first, ask questions later. It wasn’t true of course but I can’t recall seeing any trouble at York Road either. We first became aware of Trevor’s condition by pure chance, when Freddie Jizzard 'Googled' his name searching for the famous photo of him at an England away match, blood streaming down his head. It was on the front of the national papers. Not actually sure why he was looking for this, to be honest! 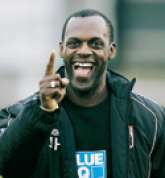 Trevor first got involved with the club in the early 1990s, via his work colleague Steve Beard, following his increased disillusionment at the direction professional football was heading. As the Chairman and co-founder of QPR Loyal Supporters Association, he managed to get a strong QPR side down to York Road for a friendly. 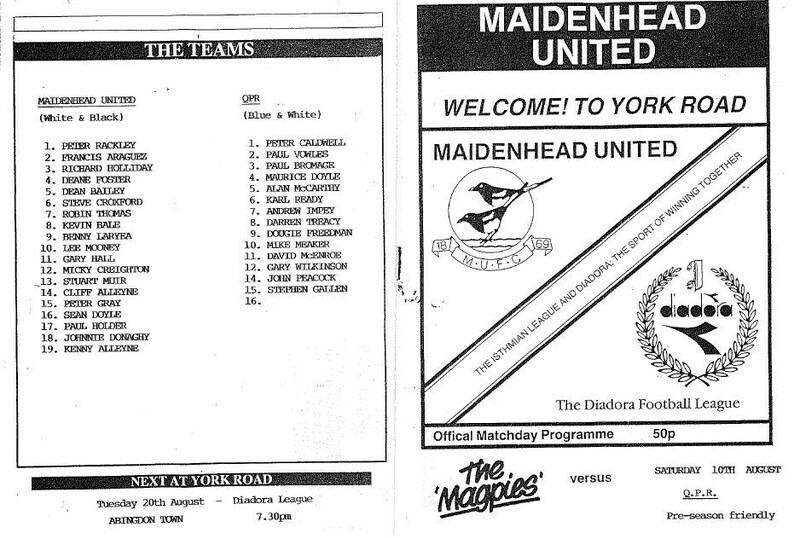 They also sponsored the game and, in the notes listed in the programme (front and back covers below), Trevor talked about the need for league clubs to “look after the Maidenhead’s of this world” and how, for such clubs, sponsorship was a lifeline. How prescient, given the ever increasing divide between the haves and have-nots. Although a key figure in the fight against a possible merger between his beloved QPR and Fulham in the late 1980s, incredible to think possible now, clearly the relative intimacy of such spartan non-league surroundings appealed and Trevor quickly became a regular at York Road. This was alluded to in later articles he wrote for the matchday programme as part of his Terrace Talk column, which we jokingly called Trevor’s Talk. A regular theme was the close affinity between supporters, players, management and committee. A committee he later went on to join. 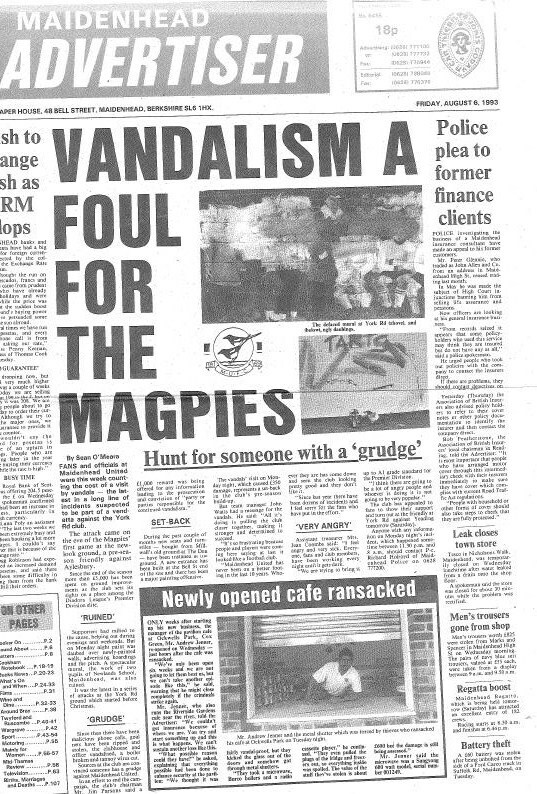 As someone not content with passive support, he quickly started up The Shagging Magpies with Steve (with whom he later went on to work with in running the youth team) the main aim of which was to raise £3,000 towards the cost of building a wall down the railway embankment side of the ground, to ensure it still met the league’s ground grading requirements as a result of the club’s promotion to the relative dizzy heights of Isthmian League Division One. Oh, the glamour! With the announcement that Millwall were moving out of the old Den, a group of us went to the ground, where we picked up a number of seats, including a few ‘extras’ in order to update the main stand at the ground. Trevor then coordinated the installation of these seats, where they remain to this day. Spare him a thought the next time you’re sat there. Issue 2 of the fanzine also saw the classic line from Trevor that “it’s us, the fans, that make’s the club what it is today”. Indeed. This issue also saw Trevor provide his thoughts on the benefits of watching non-league football, in relation to what he saw as the overpaid top-flight. More relevant than ever now, but written in 1993. “As any supporter will tell you, it’s in our blood. No Saturday passes without them attending a match”. Summarised as “next time you have a Saturday to spare pay a visit to your local non-league club. You never know, you might even enjoy it!” I understand this message was indeed passed on to his own grandson, who now watches Sutton United. Ironically, the fanzine which replaced The Shagging Magpies on the York Road terraces, Born And Bred, featured his brother Peter on the cover of the first issue. 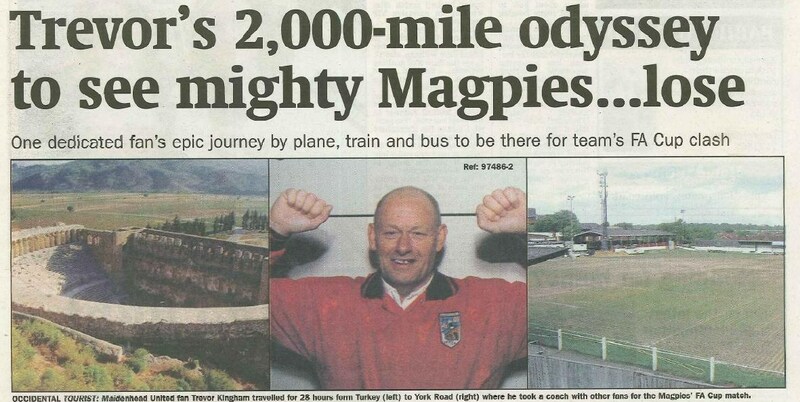 In a shot taken from the Maidenhead Advertiser article (below) on the trials and tribulations of being a Maidenhead United fan, Trevor was most perturbed to see such an irregular visitor to York Road in the main photo, remarking that it was “the only bleedin’ game he’s been to!” Mock disgust reigned. He did at least get his own section in the article. When asked how far he’d travel to watch the team, with no sense of irony he stated that he’d go to Australia. He ultimately had a chance to test this theory, albeit from the other side of Europe instead of the world. Then there were the human black and white stripes at Heybridge, courtesy of some disposable boiler suits which even had hoods and only showed faces. Faces which were duly painted, to complete the look. Trevor had, ahem, ‘borrowed’ them from his work and had suggested they’d look perfect. Injured players Mickey Creighton and Paul McDowall also took part. No disrespect to the current Maidenhead United squad, but can you imagine Nevin Saroya or Alex Wall doing this?! We felt 10 feet tall, pleased at ‘going the extra mile’ in supporting the team. We then crashed back down to earth as Maidenhead came trotting out in a blue kit (yuck, what were they thinking of…) with the home side in black and white stripes. Bizarrely, I later met a Heybridge fan on holiday in Portugal who, when I mentioned I followed Maidenhead, commented on how some strange fans had once turned up at their ground, dressed in Heybridge colours. Ahem. The following week saw the infamous Klinsmann dive at Wivenhoe. Great on a dry pitch in August. Not quite so good on a cold January in a load of mud. We did it anyway, much to the amusement of the players. Then there was the end of season fancy dress, which still exists to this day. The first one was at Lewes, with about 25 of us watching a mind-numbing goalless draw. Given his penchant for cigars and weekend stubble, Trevor’s get-up as a cowboy seemed entirely appropriate. Dressing as a gorilla at Worthing, which saw player Paul Dadson dressed as a nurse, provoked the inevitable questions of when he was actually going to get his costume on, but it was all in good humour. Although the football was the excuse for the day out, the camaraderie and togetherness provided the most enjoyable aspect of watching Maidenhead United at that particular time. It wasn’t all beer and fanzines though. Following a spate of break in’s and vandalism to the York Road playing surface during pre-season in 1993, causing the club large financial difficulties, a number of supporters including Trevor and myself agreed that we needed to try and protect the ground. We’d meet late on Friday evenings and stay until the sun rose, before catching some sleep and attending the pre-season fixture played on the Saturday afternoon. This happened for a few weeks, during which we had a chuckle at Trevor’s somewhat serious approach to the evening, with a balaclava and cosh de-rigueur attire. This approach was ultimately vindicated, though, when we caught the culprits, Trevor hiding in the stand then frog-marching those responsible to the clubhouse before the police arrived. It then transpired that one was carrying a knife and another had just got out of prison. Although there were rumours of them being associated with a disgruntled ex-manager, their capture and subsequent sentencing saw a quick end to this problem. I can only imagine what went through their minds when they were confronted by someone wielding a cosh and clearly not in any mood to negotiate! Trevor’s love of all things football eventually extended to the thermos flask and notebook brigade, more commonly known as the ground-hopper. 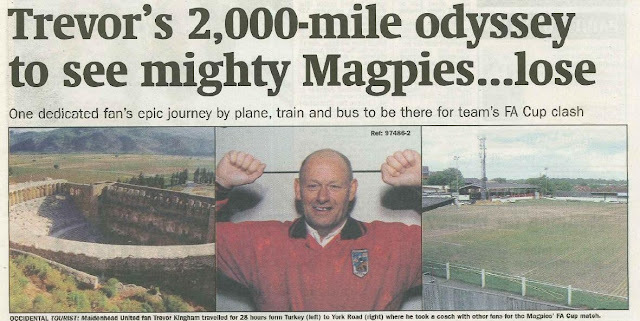 Along with another Maidenhead fan, he went on a couple of organised tours of the country, where games from one of the more minor leagues are re-arranged to maximise the number of fixtures over a weekend. Whilst I think he shared our thoughts on the odd nature of this particular group of people, who quite often seem more bothered by how many mature conifers exist in the ground instead of the events on the pitch, the opportunity to travel to pastures new quite often proved too much to resist. Whisper it quietly, but I think there’s a bit of the ground-hopper mentality in most football fans. Some difficult personal times followed for Trevor, and he ultimately decided to make a fresh start abroad. The last Maidenhead game we saw Trevor at was the Horsham FA Cup capitulation in 2007. There were well over 300 Magpies among a crowd of 3,000, and although the result was awful and they went on to play Swansea live on Sky in the next round (40+ years without playing a league side and counting…), it was great to see so many fans mobbed up in the pub outside the ground. Trevor seemed in his element, having travelled over 2,000 miles to get to the match. Not quite Australia, but Turkey’s still hardly on our doorstep. He regaled us with details of how he’d had to pave some bloke’s driveway in order to get the funds to travel over, and how he wasn’t sure how he’d get back! Offers of accommodation were offered but politely refused. Proud to the last. The next update we had regarding his whereabouts came courtesy of Google earlier this year, and the news wasn’t good. Trevor’s funeral is on Thursday 1st September at 13.40 at Putney Crematorium. A good turnout is guaranteed and of course the KSG will be represented. Apparently, donations to the Royal Hospital for Neuro-disablity - or RHN for short - will be welcomed, given the excellent care they provided for Trevor. 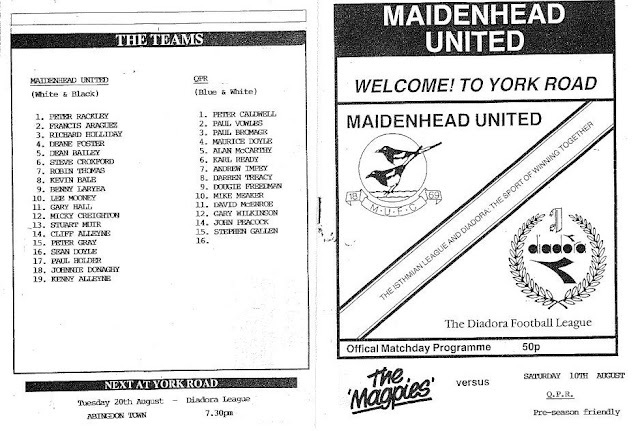 As a club, Maidenhead United seems barely recognisable to the one he left, albeit for many different reasons. It’s safe to say that it’s a much poorer place without Trevor’s presence though. They say that people aren’t really dead as long as they live on in your memories. In that case, Trevor’s never been more alive. ... overly concern us; we're still not as bad as we were under Taylor. but that hasn't happened this season"